A luxury innovative contemporary designer countertop basin from the Roca's Urban collection, manufactured from quality white vitreous china with a stunning black and white New York cityscape design surrounding the edge of the washbasin. Create a statement in your bathroom with one of our unique Urban designer countertop basins from Roca. Comes with a 25 year guarantee against any manufacturing defects. 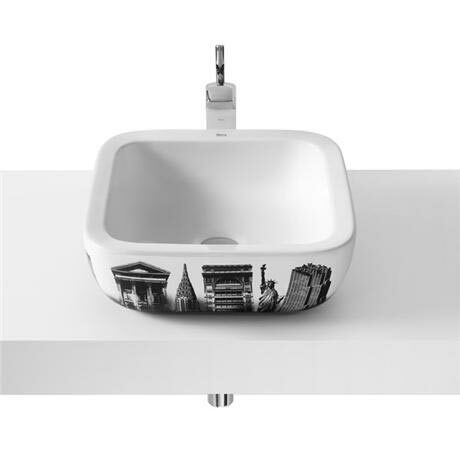 Give your bathroom a truly unique look and feel with an urban counter top basin from Roca. Their innovative designs make them a stunning addition to any bathroom and their incredible build give them a robust and durable finish. It is made from vitreous china meaning it is hard wearing and easy to maintain, and also comes with a 25 year guarantee. The New York design encompasses all things associated with the city, making it perfect for lovers of New York.